Every dad has said it at some time “Are you trying to cool the neighborhood? Turn the air off if you are going to have the windows open.” Then you walk over to the thermostat and turn off the cooling system so you can go back to enjoying the fresh spring air. In this case, dad isn’t always right. 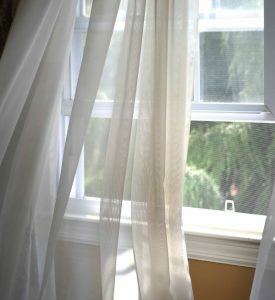 Everyone loves feeling a cool breeze pass through their home on the first warm days of spring. It is not only refreshing but also can save some money cooling your home without turning on the AC. With the sun’s rays still beating down and warming your home, it can sometimes become warmer inside than out. Turning the AC off will save energy, but turning the whole system off can make your home even stuffier. When you turn your whole cooling system off the only air moving in your home would be the breeze in the room you have the windows open in. The best solution is to leave the systems fan on while turning the cooling off. The fan uses very little energy and will spread that wonderful spring air through your whole home. While you’re at it, make sure you have your ceiling fans on to move even more air around. Running the fan has the added benefit of running the air through your systems filter and removing the allergens as well. Read more about removing allergens from your home here. Keeping the fan running while turning off your AC is very easy. Just change the “cool” setting on your thermostat to “off” and change your fan from “Auto” to “On.” This will make the system sound like it is cooling your home but will only be running the fan. You can tell if you have set it right if the air coming from your vents is room temperature instead of cool. We hope this helps you enjoy the spring air indoors and saving you money. If you have any questions for want more tips give us a call.